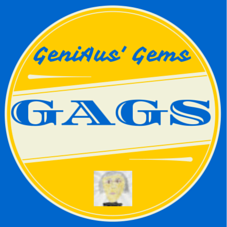 The weeks roll by quickly here at the GeniAus office, can't believe it's Friday again -time for the next edition of GeniAus' Gems. Reading genealogy and related blogs is an important part of my ongoing CGD, my weekly GAGs post gives me an opportunity to share posts that have resonated with me and to highlight some blogs that my be unknown to you. I make no apology for my strong Australian bias. 1. A beaut aggregation of resources for your society from my Dear Genimate DearMyrtle in Utah. 3. Can you help Sharon from NSW solve her mystery? She is fortunate to have such a trove of family treasures. 4. A lecture at SAG prompted Maria to do a series of posts. 5. Dawn's mission is to "find descendants of the unwanted/unloved vintage photographs I've found in my travels around NZ & on the Internet"
9. Could this chap James found on Trove be related to him? 10. Are any of your names longer than this one found by a SLWA researcher?